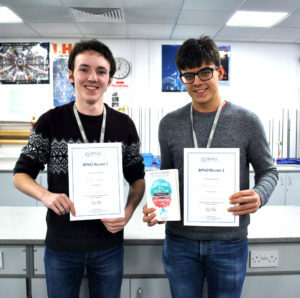 Congratulations to our physics students Harry Best, Harry Clipston, Alex Stevens, and Jack Dale who all achieved an award in round 1 of the Physics Olympiad competition. The Olympiad is a demanding national competition set by Oxford University, designed to stretch and challenge the top physics students in the country. Harry Best’s results put him in the top 100 students nationally and he was invited to take part in round 2 and in the astrophysics Olympiad. As a result of his outstanding performance in these recent rounds, he has been invited to take part in a training camp at Oxford University in April, where selection for the national team will take place. We wish Harry the best of luck in the next stage of the selection process.